Andrew E. Jurman graduated in 1980 from S.U.N.Y. New Paltz with a Bachelor of Fine Arts degree in photography. He experimented with the medium for many years, but spent the majority of his time developing and perfecting his in-camera, multiple exposure technique. 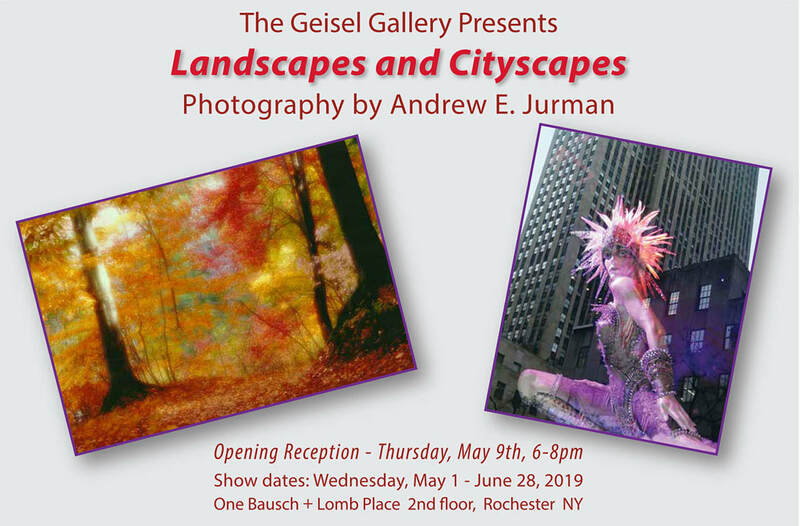 A Rochester, New York resident since 1983, Andrew has gained recognition for his experimental work in photography. He has had work selected for national art competitions, received merit and purchase awards and has been published in calendars and magazines. His work is on display at several major corporations and has been exhibited at over 20 art galleries in and around the Rochester area. The work that you see in this show consists of both his color landscape photography which is done in the camera and shot on Color Negative Film, and also a series of digital photographs taken at New York City’s Rockefeller Center in December, 2015. The figures stand out against the reflections of the skyscrapers ... a juxtaposition of reality and fantasy.